As of July 1, Australian businesses emitting large amounts of greenhouse gases will be required to monitor and measure the emissions ahead of reporting them to the government by October 2009. Senator Penny Wong, minister for climate change and water, said the requirements are part of Australia's new National Greenhouse and Energy Reporting System, designed to monitor the heat-trapping emissions responsible for climate change. "The National Greenhouse and Energy Reporting System will be an important part of our efforts to tackle climate change as we move to establish an emissions trading scheme," Senator Wong said. 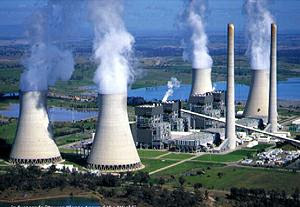 "The emissions trading scheme is at the heart of the Rudd Government's plan to reduce greenhouse emissions. It is the best way to tackle climate change at lowest cost to families and business," she said. "This new system will play an important role by more precisely quantifying the greenhouse gases Australia produces. It will also, for the first time, provide robust and comparable information to the public on the greenhouse and energy profiles of Australia's large corporations." From July 1, corporate groups that emit 125 kilotonnes or more of greenhouse gases each year, or produce or consume 500 terajoules or more of energy, will be required to collect data to meet annual reporting requirements. Corporations controlling facilities that emit more than 25 kilotonnes of greenhouse gases, or use or produce 100 terajoules or more of energy, will also need to collect data. The ministry provides these comparisons - 25 kilotonnes of greenhouse gas emissions is equivalent to the annual emissions of more than 6,200 cars, while 100 terajoules equates to the annual energy use of around 1,900 households. While the National Greenhouse and Energy Reporting Act takes effect on July 1, corporations will have until August 31, 2009 to apply to register under the scheme, and until October 31, 2009 to submit their first annual greenhouse and energy report. "Many of these corporations already report their emissions and energy use to meet investor demands under existing programs, or as part of a growing corporate commitment to social responsibility and sustainability," Senator Wong said. "But others may be unsure as to whether or not they are covered by the system, and the Department of Climate Change will work closely with them to ensure they can comply," she said. The Department of Climate Change has developed an online calculator to help businesses work out whether or not the system applies to them. The department will continue to run information sessions and provide guidance on using the online reporting system, along with a reporting hotline. Amendments to the bill establishing the National Greenhouse and Energy Reporting System were proposed in Parliament today. The amendments would allow publication of information by the government relating to the methodologies used by corporations to calculate their emissions and clarify the scope of the minister's power to specify methods for calculating emissions, among other minor adjustments to the Act. Australia's largest companies have been planning for the start of mandatory greenhouse gas reporting since last year when the Howard government was still in power. Katie Lahey, chief executive of the Business Council of Australia, wrote last October in "The Age" newspaper, "...businesses cannot afford to sit back and wait for trading to formally start before planning to tackle the implications for their strategies and operations of what is a fundamental long-term transition from a high-emissions to a low-emissions world economy."